I recently posted regarding my switch to the T-Mobile G1 phone, the hardware of the G1, and finally the software experience. In the most recent posting, however, I had decided to switch back to the T-Mobile Dash – my previous mobile phone – to see if my temperament would improve any. Well, I’ve been back on the Dash for almost a month now, and I thought it was about time to give an update! My brother was kind enough to send his old Dash phone to me. A wipe and reload was in order, so I grabbed one of the latest and greatest Windows Mobile 6.1 ROMs (NRG Rose ROM v1.7) and started in. I couldn’t get the ROM loaded via my Win7 Beta desktop machine, so I grabbed a Vista laptop that I had sitting around at work. Walked through a few steps, the phone restarted a couple of times, and I was up and running with WM6.1 in less than 30 minutes or so. This ROM already includes some very nice homescreen enhancements, a weather plug-in, Office Mobile, PDF reader, an “auto configurator”, CeleTask, and some other great updates. To be perfectly honest, the NRG Rose ROM v1.7 is better than my previous ROM in nearly every way. A number of hoops that I previously had to run through ‘post-install’ are now no longer necessary, which is great. Pretty much the only major install I made was loading Opera Mini, which is a very good and capable browser. One of the beauties of having your contact/calendar info “on the web” is the ability to quickly re-sync your new phone and be all ready to go within minutes. In my case, I sync’d my phone with our corporate Exchange Server and had my contacts and calendar info back on my phone within minutes. I love that. Beyond that, I assigned my speed dial buttons to the folks that I call most often, and finally set things like ring tones, notification sounds and so forth. That’s about as much “dialing in” as I really need to do. Having migrated from the Dash to the G1 and back to the Dash again, I was really curious about what my experience would be. Honestly, I was expecting a bit of “oh, yeah… the Dash has this or that problem”, quickly getting frustrated, and ending up back on the G1. After all, the Dash is about 2.5 years old now, running the (not-nearly-as-schwanky) Windows Mobile OS, and sporting older, slower hardware. It oughta be a slam dunk in the Android-based G1’s favor, but it really hasn’t been. DIALING: A basic phone call on either device is really pretty easy – assuming that you’re manually entering a phone number. The Dash is really no better or worse, in this regard. Finding a contact quickly, however, does seem to be faster on the Dash – primarily due to the ‘right there in your face’ keyboard. SPEED DIALING: One of my “peeves” with the G1 was the inability to make a quick phone call to those folks that I contact most often. I would venture a guess that I call the same 10 phone numbers roughly 90% of the time, and I’m guessing that a lot of other people do the same thing. On the G1, a “speed dial” of this nature required at least six clicks to accomplish. Frustrating. The Dash, on the other hand, with appropriately configured “speed dial” keys, is only three clicks to perform the same function. CALL QUALITY: I didn’t have a lot of complaints about call quality on the G1. The earpiece on the Dash, however, is a bit quieter, and seems to vary somewhat depending upon how you’re holding the phone. I would say that the G1 is better for outside use, and either phone is acceptable indoors. Using a Bluetooth headset, of course, makes the point moot. RECEPTION: Strangely enough, I noted a *very* nice increase in phone reception when I first got my G1. My house is in a bit of a deadzone, but the G1 really seemed to get “more bars in more places”, if you will. I was fully expecting that the Dash would again suffer in this area, causing me much grief and heartache. Thankfully, this hasn’t been the case! I don’t if the new WM6.1 ROM I’m using has better radio code, or if it’s the physical phone itself, but I’m really not seeing a discernable difference in reception – it’s quite good with this Dash. What I have noticed, however, is a huge decrease in dropped calls since switching back to the Dash! I don’t know if it’s a 3G network issue (which the Dash cannot use) or something physically wrong with the G1 I had, but it would drop calls without fail in certain places. The Dash has not done this. RINGING: As I had reported with the G1, I was quite consistently missing calls when I didn’t have the phone physically on me. Basically, the phone was quieter and (especially at home) I often couldn’t hear the phone ring at all if I was in another room. This hasn’t been an issue with the Dash, thankfully, and I’m hearing the phone ring much better than before. Also, the Dash has a “vibrate first, then ring” setting for your ring profile. 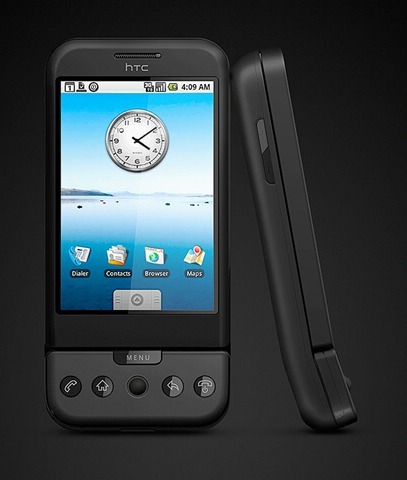 The G1 did not offer this, nor do many phones that I know of. I’m happily using this setting again, and I much prefer it for office-use. If the phone is in my pocket, I’m usually able to answer (or “silence” it) before my co-workers ever know that a call came in. CALL LOG: Since I mentioned it in my “software” review of the G1, I should probably counter here. Quite frankly, the G1 did not offer much in the way of full-featured call logging. It’s all well and good to know that so and so called me yesterday, but at what time? How long was the call? The Dash gives me this information, and I appreciate that. Not everyone’s cup of tea, but it’s important to me. 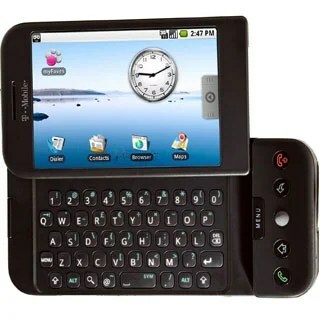 TYPING: Although the keyboard on the G1 is much larger, it’s not necessarily better, as I quickly found out. I never quite got “used” to the G1’s keyboard – even after 2 months. It’s not horrible, by any means, but the keyboard on the Dash is clearly easier to type on – at least for me. Also, the ability to ‘hold a key down and get the alt-press symbol’ is a real time saver. I do wish that the Dash had both right and left Shift keys, but aside from that the Dash is a better device for typing on. Lastly, the fact that you had to “slide out” the G1 keyboard made me want to go to the keyboard less. Take that for what it’s worth. TEXT MESSAGING: Both the G1 and the (WM6.1-enabled) Dash allow for threaded SMS text messaging – a “must have”’ for cell phones these days, in my opinion. The G1 is probably better for managing my text messages, but the typing (as I’ve mentioned) somewhat negates any improvements there. The text messaging app is certainly much nicer to look at on the G1, however. No contest there. BROWSING: This is an area that is clearly in the G1’s favor. The screen is larger, touch screen-enabled, features 3G network support (where available), and uses a much newer browser technology. I’m not even going to argue that the Dash comes close to matching the browsing-ability of the G1. It doesn’t. I will say this, though: using (the free) Opera Mini on the Dash closes the gap a surprising amount. In my non-scientific guesstimating, I would say that Opera Mini is as fast at pulling up pages on the EDGE network as the G1 is on the 3G network. I’m not going to bother to explain why, because I really don’t know. Opera Mini is really a very clever browser, though, and makes using the web on the Dash much more palatable. Between the two, though, the G1 is clearly a better Internet-capable device. EMAIL: Much like the Text Messaging report, using Email on the G1 was generally a “nicer” experience, though not necessarily better. For my Yahoo! Mail account, the G1 is preferable and works well. For my Exchange mail, however, the Dash is still a better device – and primarily because it has built-in Exchange support, where the G1 does not (yet). CALENDAR: The calendaring on the Dash is not great to use, though the tie-in functionality with Exchange Server is great. Purely from a visibility standpoint, the G1 is much better. I use appointments very often, which both devices handle well, but the basic calendaring viewing is better on the G1. CAMERA: The photo quality (and interface) on the G1 are definitely better than on the Dash. The Dash, however, seems to take pictures more quickly – mostly due to the slow auto-focus behavior of the G1. Between the two, however, I’d rather have the G1’s camera. STABILITY: The G1 was a fairly stable device, and so is the Dash. I find myself managing programs on the Dash more than on the G1, but I’m also fine with that. If I didn’t manually close some apps, I’m guessing that the Dash would bog down a lot more, which would eventually lead most people to simply restart the phone. Quite honestly, WinMo does not manage memory that effectively, but I can. The ROM that I’m running maps a key to the CeleTask app which allows you to very easily close apps and free up memory. I don’t mind doing that, but a lot of people probably do. That said, I’ve noticed that the G1 has some marketplace apps to “manually close” running programs. From my experience with the G1, it didn’t manage memory (& apps) all that well either. At this point, I’m back on the Dash and am staying here until I find a device that is truly better. The T-Mobile G1, while clearly a nice device, was not better for me, and (as I’ve harped on before) actually made some functionality more difficult. That said, if you tend to browse on your phone a lot, enjoy downloading apps/games, or need GPS functionality, then the G1 may be a better choice for you. However, if you use your phone primarily for phone calls, text messaging, and email, then I would argue that the T-Mobile Dash is the better device between the two. I’ve been using the T-Mobile G1 phone for a couple of months now. I had previously posted on the hardware aspects of the G1, but had never really gotten around to the software side of things. I think that that has ended up being a good thing, because I’ve come down from out of the clouds, so to speak. Whereas my experience with Windows 7 (beta) has only grown more positive with time, my feelings regarding Android – the OS on the G1 phone – have become increasingly frustrated. That’s not a good thing. I’m not comparing the two platforms, of course, but rather the experience of using the two after an extended period. Switching to an entirely new mobile platform has really opened my eyes. While most folks – including myself – enjoy the “new phone experience”, things don’t necessarily improve. 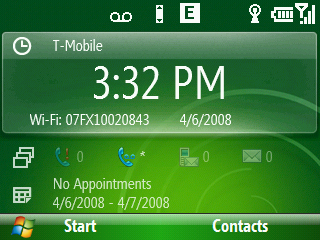 My previous phone – the Windows Mobile-powered T-Mobile Dash – gets flambéed pretty regularly in the usability and stability departments. I wasn’t a grumpy Dash user, by any means, but it seemed like it was time to move on. 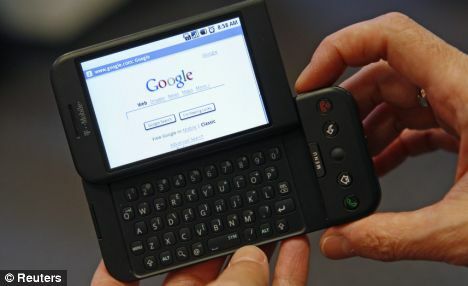 Besides, here comes Google with a schwanky, new mobile OS that just has to be better than the old-school WinMo OS, right? I’ve been very, very surprised at how the most simple of operations can vary from phone to phone. Some for the better, some for the worse. After about a month of using the G1, it became increasingly apparent that simply placing a phone call to a “favorite” person of mine was more difficult that before. I chalked it up to “new user” stuff initially, and figured that the added benefit of 3G network speeds, decent browser, and other improvements would eventually outweigh my frustrations. I’m beginning to think that the opposite is true. 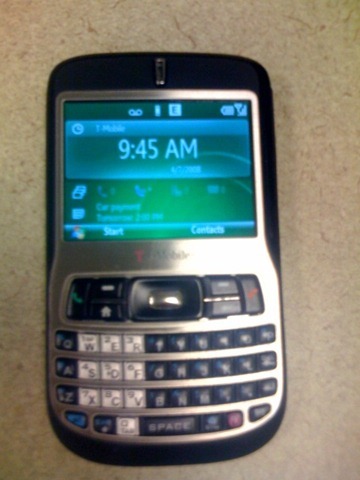 The interface of the G1 phone is, in my opinion, initially very favorable. Chalk this up to the “eye candy factor”, as many of us are coming from Windows Mobile phone, Nokia devices, Samsung, or what have you. Clearly, the Android OS is doing more than the typical mobile phone device, and it appears to be impressive. Your primary means of moving around the interface, of course, is the touch screen. It is really fairly responsive, and in some ways very natural. On most any screen (or any program), you can hit the MENU button just below the screen to bring up additional options, which is all fine and dandy until you are expecting to get more options by hitting the MENU button, but nothing is there. For instance, open the DIALER page and then hit the MENU button. Whassat? It does nothing?? Exactly. Consistency within the Android interface is lacking. On that same note, there are times when using the screen to accomplish a task is nearly impossible with the touch screen, which then relegates me to the scroll ball (which I dislike strongly). It’s aggravating and ends up feeling like a step-backward technologically, if you ask me. Another interesting UI bit is the “long press” of a button or icon. Pressing a contact, for instance, will automatically open the info view for that contact. Pressing and holding the contact, however, will bring up a right-click-type menu with additional options: send SMS message, edit contact, delete contact, and more. Sadly, many items don’t have any long press behavior, and you begin to second-guess what you can/can’t do in certain places. 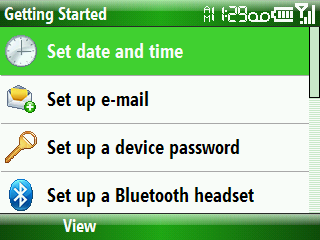 The desktop on the G1 can be split into 5 logical areas: the central desktop view, the left-hand desktop (off-screen), the right-hand desktop (off-screen), the top/notification bar, and finally the dragging menu. Rather than having nearly everything crammed onto your initial home screen view (*cough* iPhone *cough*), the G1 can be very minimalistic, if you prefer. My central desktop typically holds only 4 icons + the analog clock (which I don’t think I ever really look at). Swiping your finger to the left or right (I like the movement of the desktop as it shifts, by the way) gives you the extended desktop views, and potentially additional areas to store easy-to-launch program icons. My primary beef with the extended desktop views, is that you would never know that they’re there unless you were informed of their existence. There is no “visual” indicator that anything lives to the left or right of your primary desktop screen. Each screen can, of course, be populated as you see fit – with as many (or as few) program icons as you like. It is possible to have literally nothing on your desktop. It is also possible to have each screen chock full of program icons, and to have them grouped logically according to your liking. I do like having the choice, to be honest, as many phones are pretty set in how configurable the desktop/homescreen are. The top/notification bar lets you see the time, battery level, network strength, Bluetooth connectivity, wireless connectivity, and other “activity” notifiers – missed calls, voicemail, new text messages, installed programs, and so forth. Swiping your finger from the top of the screen downward lets the notification bar fill the screen with more useful info: a small snippet of a text message, info from a missed call, a direct link to your voicemail box, etc.. There have been many instances, however, where the notification bar just doesn’t come down. I’m swiping and swiping, but it does nothing… until, of course, it finally does. Strange. The menu on the G1 is always present at the desktop – no matter which desktop view you’re at, or which screen mode (portrait / landscape) you’re currently on. Swiping the tab of the menu outward allows the menu to expand fully onto the screen, thus revealing your program icons. 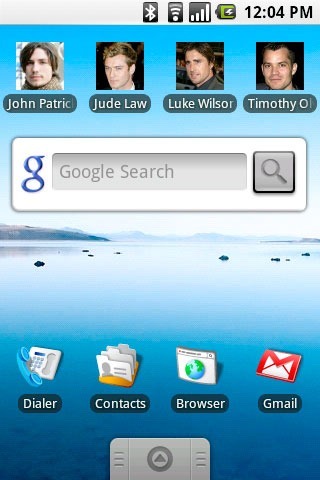 It’s like a Start Menu for the Android, except that it’s only on the desktop. Programs icons are listed alphabetically, as you might expect, and you simply scroll through the icons using your finger or the scroll ball. Strangely, you scroll from the bottom up using your finger, but roll the ball downward to crawl down the list. My main issues with the menu are three-fold: 1) the scrolling performance of the menu is pitiful and can really dog at times, 2) the more you install, the longer the menu gets (typical), and 3) the menu is only available from the desktop views. I can’t access it from “just anywhere”. Honestly, I expected better on-screen performance from the G1. As previously mentioned, some screens can really slow down, which makes for a less-than-desirable experience. I don’t know exactly how Android manages memory, but it appears to do so fairly poorly. I’ve resorted to using an app called “Close Applications” to keep performance a bit snappier, but it can only do so much. Moving within an application is usually fine (email, dialer, messaging, etc. ), but moving between applications can be chunky. It really seems as if the phone itself it slowing down, as it still feels sluggish after a shutdown/restart. Perhaps the latest updates have introduced this? Another thing worth mentioning is the 3G network performance on the G1. This is really indicative of T-Mobile more than the phone or OS, but warrants a comment or two. Having been stuck on Edge speeds for years, I was really looking forward to the increased 3G speeds. In actuality, though, it seems that in some cases the Edge network is faster and more responsive. I’m often in areas that have full (or nearly full) bars on the 3G network, yet sometimes the browser or email sync takes forever, often timing out. The Edge network, however, seems more consistent. I haven’t done any actual speed tests, so my “gut feeling” is the best I’ll give right now. I can’t say a whole lot about the stability of the G1. It’s been fine, but not perfect. Although I’ve not had a true OS crash, per se, I’ve had a couple of situations that required shutting the phone down and restarting – in fact, one instance happened just yesterday! Also, I’ve had a few applications crash with a fairly cryptic message, but in each case restarting them worked fine. The Dialer is really comprised of four areas: the number pad “Dialer”, Call Log, Contacts, and Favorites. Each section is as you might expect, save for the favorites, which might be new to any non-iPhone users. Basically, you can “star” any contact you like and they will be placed on the Favorites tab. A speed dial section, if you will. The Dialer tab looks like a round-button keypad. You can use your finger to hit the buttons, type out a number, and then hit the call button to dial that number. The number pad is quite responsive, actually, and includes letters on the buttons for help when dialing 1-800-FLOWERS! :) While in a call, the number pad (typically) hides at the bottom of the screen and can be “flicked” up, if needed. It sometimes hides, but not always…and I’m not sure why. Also, the phone quickly goes into “screen off” mode while in a call, so looking at your screen and/or manipulating the phone while in a call requires hitting the MENU button before you can do anything. It’s not a big deal every now and again, but listening to a series of voicemails, for instance, requires more interaction with the phone than you would expect. Lastly, the Dialer pad does feature additional options via the MENU button while in a call. You can activate the speakerphone, swap calls, mute the current call, and so on. Nice! On the negative side, I’ve noticed that incoming calls do not show up on the screen until after the first vibrate and subsequent first ring. Since I am always screening my calls, this is an irritation to me, and it seems to have started with the most recent Android update a week or so ago. Thanks, fellas. The Call Log is more-or-less what you would expect, as it just keeps a running log of calls you’ve made, received, or missed – newest at the top, naturally. 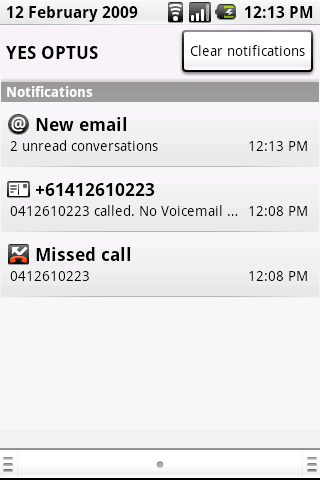 Tapping the icon for that call log entry allows you to dial them back. What the call log lacks, however, is the ability to gather fully-useful information on the call. I can see who the caller was, how long the call lasted, and when the call was made/received – kinda. Save for the current day, all other calls in the log simply say “yesterday”, “3 days ago”, or something along those lines. I cannot find the exact time of that missed called 3 days ago, if I wanted… and sometimes I do want that information. Another example of “newer, but not necessarily better”. The Contacts tab is simply a gathering of your phone contacts in a scrollable list. They are (strangely) sorted by first name, and I’m not sure how to change that. Flicking your finger upward lets you scroll down the list of names. After that initial flick, and “tab” is revealed on the right-hand side of the display which you can grab n’ drag to move the list up or down through the list. Nice!… except that the list really jitters as you try to hone in on a particular contact. It feel “buggy” to me. Clicking on a contact opens the info view for that contact, which allows you to see their phone number(s), SMS address(es), email address(es), and mailing address(es), where applicable. You can also interact with any of those items from that view. Hitting an SMS address, for instance, opens the Messaging app where I’m then sending a text message to that person. Hitting the MENU button from within the contact info view allows me to edit or delete that contact. The Favorites tab is where your “starred” and most commonly accessed contacts will automatically go. As mentioned before, this is a speed dial view, of sorts. My big issue with the Favorites views is the lack of time saved having a contact there. In my opinion (and previous experience), I’m usually wanting a particular phone number in a speed dial – not just the contact. For instance, I contact my brother quite frequently throughout the week. Although he has a couple of phone numbers to reach him at, I’m calling his mobile phone number 99% of the time. I would then, of course, set his mobile number as a “favorite”, right? Uhhh, no. Not in the Android world. Instead, his “contact” is a favorite, which means that I either have select him once to open the contact, and then select his mobile phone *OR* I use a long press on his contact record to bring up a secondary menu which includes calling his mobile phone. Either way, it’s a waste of time. This brings me to a MAJOR sticking point with this phone, and many others like it: previously simple operations have become more difficult and time consuming. Case in point (already mentioned): making a phone call to my brother’s cell phone. On my T-Mobile Dash (as a comparison), I would hit two keys to unlock the phone, and then press-and-hold the 8 key to dial him. Done. On the G1, however, I hit the MENU key twice (yes, twice), then select the Dialer, then hit the Favorites tab, perform a long-press on his contact record, and finally select the “Call mobile” link. In some cases, of course, I have to scroll before I get to their contact record, which just adds an additional step. This extra effort become even more noticeable (and dangerous) while you’re driving – and I do use a Bluetooth headset. These extra steps aren’t totally unique to the G1 either. My good friend Andy, who uses an iPhone, has nearly as many steps to make a “speed dial” type phone call. This is progress? Knock the WinMo/Dash combo all you like… at least I can perform simple functions more quickly and easily. Performing basic text messaging on the G1 is really quite simple, and you can go about it in several ways. With the keyboard open, start typing a name. 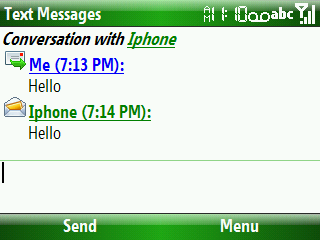 When the name shows up, press-and-hold the contact and choose Send SMS/MMS. A new text message opens with the recipient already filled in for you. Type your message, hit Enter, and you’re done. Or, if you prefer, choose the Messaging icon from the desktop view. Select ‘New Message’ and then begin typing in the name of a recipient. Enter your text message, hit Enter, and the message is sent. Finally, you can also select the contact from the Contacts (or Favorites) view. Open the contact or use a long-press, and select the Send SMS/MSS option. The messaging is, of course, threaded like any modern mobile OS. It’s generally easy-to-read and fairly straight-forward. A long-press on any thread allows you to delete that thread, if needed. 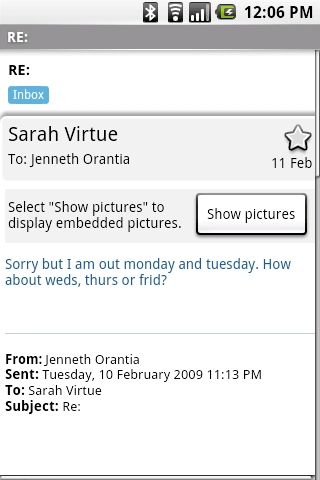 I like the email client on the G1. It looks like nice, and managing a couple of email accounts has been very easy. My primary Yahoo! account was sucked into the G1 with ease, and has only given me issues twice – which required removing/re-adding the account to my phone. Viewing/replying-to a message is not at all difficult, and is really much more enjoyable than it was on my Dash. As you may (or may not) know, the G1 does not by default support Exchange syncing, which is a bummer. There are some 3rd party apps that can help in this regard, but they all have their issues. True Exchange-sync capability built-in to the Android OS would be awesome, but it’s simply not a reality at this point. In fact, the Android team claims that that functionality will be relegated to 3rd party apps long term, so I wouldn’t hold your breath for a built-in solution. Sad, really. 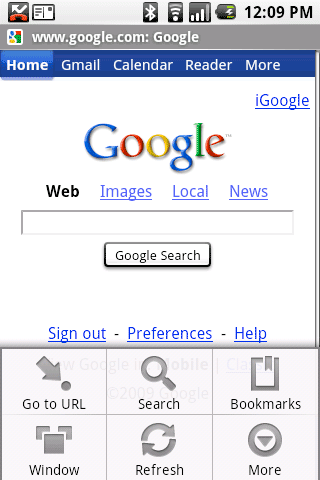 The Webkit-based browser that comes with the G1 is a very capable application. Though it does not support Flash, it does support most websites that you will come across. Whereas I felt very land-locked with browsing on the Dash (last resort only! ), the G1 feels free and capable. Page load times are acceptable over the 3G network, though rarely impressive. The ability to have several website tabs open concurrently is nice, though I’m rarely browsing that way on the G1. The built-in “search” functionality is great, and I appreciate not having to go back to a Google page for each search. Manipulating a browser session, on the other hand, is somewhat tedious. Moving around a loaded page is easy-to-do, but zooming in/out is more difficult than it ought to be. The pinch/expand functionality found on the iPhone really ought to be mimicked here, but probably cannot be for patent reasons. Instead, you are presented with (+) and (-) buttons for zooming, and they’re not always as responsive as you might like. Functional, but not great. All in all, the browser is a nice application. One of the oft-mentioned benefits of the iPhone platform is their marketplace. The G1, of course, has their own marketplace, and the experience is fine. 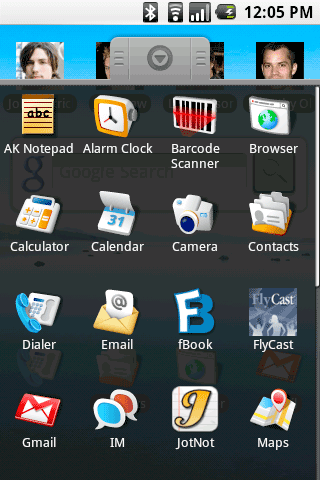 You can quite easily access handy applications or exciting games, and then download them to your phone. Most apps are “rated” by users, which allows you to see the more popular selections first, if you like. My problem with the marketplace isn’t the ability to easily download (free or purchased) apps, but rather the intrinsic value of doing so. It seems like a classic quandary of “accessibility vs. quality”, and quality seems to be losing the battle. I’ve probably downloaded 15 apps since having my G1, but only about 3 of them were truly worth a darn thing. Some are buggy, slow, and aggravating. Others I’m downloading to make up for something that the G1 phone lacks – the “Locale” app, being a case in point. Otherwise, I’d rather not have access to the iHurl or iFart applications out there. It’s trash, pure and simple. That said, I guess I don’t really have a problem with the marketplace, but I’d really like to see more quality applications and less junk. I know that Apple is releasing a “Premium” section to their marketplace, and it may be for this very reason. With the most recent Android update, the GPS (“Maps”) portion of my phone appears to work finally, although it thinks that I work in the middle of Elliott Bay, for some strange reason. Getting driving directions from my current location to a new spot is very easy to do – including directions to the address of a Contact, or something in my “history”. Nice! The built-in calendar on the G1 is nice app, with a very similar look-n-feel to the built-in email application. Moving from day-to-day is as easy as swiping your finger left or right. A meeting or appointment shows up in its allotted time slot, with (usually) only the subject being visible. It is possible to select the calendar item and gather more information via a “quick view”, though I’ve noticed that on many occasions it actually opens the calendar item instead. Although I use a calendar quite a bit, I’m not accessing my phone calendar all that often. The included calendar may not be sufficient for some users. As with many phones, the G1 ships with a nice selection of ringtones and notification sounds. I’ve selected a very run-of-the-mill “old school phone”-type ring that isn’t too grating on the ears. That said, I still seem to miss a lot of calls and notifications, though their respective volume levels are maxed. I honestly don’t know what the deal is there. Either the volume level is just too quiet, the vibrate is not strong enough, or some combination therein. I’m not sure where to place this item, so it’ll live here… and I’ll call it wacky voicemail behavior. On several occasions, while checking voicemail, my phone has appeared to respond to some sort of voice command. I’ll be checking my voicemail, listening to a message, and all of a sudden it acts as if I’ve pressed an option on the keypad, which I didn’t. In one instance, I was connected via Bluetooth, listening to a voicemail, and was told “Voice message saved”, which I didn’t want to do. I was neither touching the phone, nor the Bluetooth headset, but my youngest son (who was in the room at the time) had said something loudly. I’ve experienced this type of issue on a half-dozen occasions, I would say. This review would have been very different had I written it a month ago. I might have gushed about the “pretty things” in the Android OS, and some neat apps that I had downloaded. It is much more fitting to be reviewing the G1 now, however, because the “honeymoon is over”, as they say, and you slip into normal life – complete with its ups and downs. My honest opinion is that the G1 succeeds in many ways – a nice phone with some very compelling features – but also fails badly in many more important features. For instance, making phone calls and checking voicemail have become more laborious to me than they have been in years. I feel like I’ve gained dramatically in my 10% usage scenarios (browsing, installing apps, getting directions), while losing ground in my 90% usage scenarios (making phone calls, finding a contact, call history, etc.). I’m honestly not sure that I’ve gained enough to warrant the frustrations I’ve had. I can only review a phone as I use it, of course, and your own mileage may vary dramatically. If you find yourself playing games, watching YouTube videos, browsing the web, and getting directions very frequently and throughout the day, then this phone may be a great fit for you. However, if you are, like me, primarily just a ‘phone call / text message’ user, then you may be frustrated within a few weeks. I have been. As a matter of due diligence, I think I’m going to go back to my T-Mobile Dash for awhile – to see if I’m seeing things clearly or not. I’ll report back what I find!